From the opening scene, in which a man searches bodies on a battlefield and imaginatively recreates what has happened blow by blow, it's obvious this is a very good book. For years I have been recommending Iain Pears' AN INSTANCE OF THE FINGERPOST as my favourite historical mystery. TRAITOR'S FIELD is my new favourite. It's literate, learned without forcing the reader to sit through pages of the author's research, complex, and indefinably authentic. The book's events take place in Britain in the years between 1648 and 1651. It's a tumultuous period, from the final sputterings of the civil war in England and the execution of King Charles I, through the false dawns of Royalist hopes in Ireland and Scotland, to the ignominious escape into exile of Charles II. 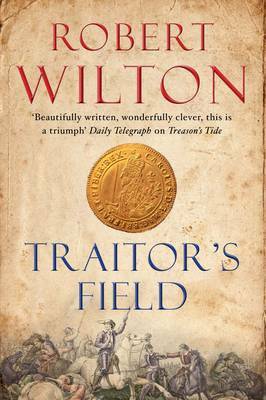 It's the story of two intelligence men working on opposite sides of the conflict: the Royalist Sir Mortimer Shay and the Parliamentarian John Thurloe. Shay is depicted as a semi-mythic figure criss-crossing the country stirring up his network of Royalist sympathisers but rarely coming out of the shadows. When he does emerge, he is a solid-as-a-rock veteran with 30 years' experience of battle across Europe. By contrast, Thurloe is green, a lawyer rising through the ranks of Oliver Cromwell's fledgling intelligence service, painfully aware that he is playing catch-up, but not sure who against. Both men become obsessed with uncovering the truth about the killing of the Leveller ringleader Colonel Thomas Rainsborough during what, on the face of it, was a botched attempt at a kidnapping. Then the nightmare: the earth shuddering and the heads screaming and the drowsy clusters of men dragging themselves awake and somehow up, and staggering and clutching for shoulders and weapons and clarity and the nightmare is on them. The nightmare is Cromwell, vast leather-and-metal men on rampaging horses, exploding dark out of the night, monstrous grey-brown shadows and a madness of noise. You have to meet TRAITOR'S FIELD halfway. It's not always obvious what's going on or who's doing what to whom, but it is well worth the effort. Shay and Thurloe are worthy predecessors to John le Carré's Smiley and Karla.